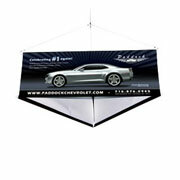 Advertise your message clearly at any retail location, special event or trade show with a banner stand. Each package includes the printing of your own submitted artwork. 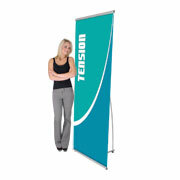 Have questions about choosing the right banner stand for your marketing needs? Call toll free at 1-855-536-3385 or inquire here. 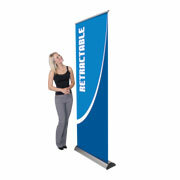 Also known as ‘roll-up’, or ‘pull-up’, banners, retractable banner stands are designed to handle frequent travel and use. 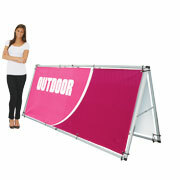 Stable, rigid stands that can adjust to display at different sizes. The graphics are easily replaced. A great option when you need something very lightweight, easy to carry, and easy to ship. 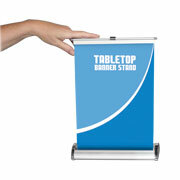 Smaller-sized banner stands designed to command attention on a countertop or table. Designed to last and built to withstand multi seasonal weather without compromising the look. Made to hang from the ceiling to be seen from just about anywhere on the floor. 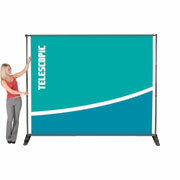 Ideal for tradeshows, conventions and large conferences.